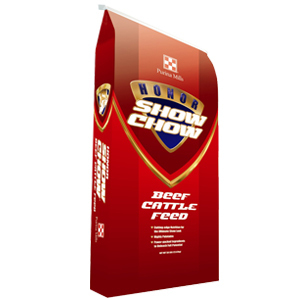 Honor Show Chow Grand 4-T-Fyer concentrate is a blended supplement that can be mixed with corn, oats, barley and beet pulp to provide a high quality ration for show cattle. This flexible feed allows you to adjust the grain level to fit your goals and needs for breeding cattle, steers and feeder calves. The Winning Matrix™ Efficient production requires a thorough understanding and application of the fundamental principles of good husbandry and sanitation. The Purina Mills® Winning Matrix™ program will help you step into the spotlight. 1. GOOD BREEDING: Practice a sound genetic program of selection and culling. Visit a professional breeder for more information. Know the feeling when you have that perfect animal that has the best potential to win. 2. GOOD FEEDING: Proper nutrition for different needs and lifestyles starts with Honor® Show Chow® products. Feed at regular times at least two times daily, with three daily feedings preferred. You can’t become a Grand Champion without the best nutrition. 3. SOUND MANAGEMENT: A clean environment minimizes stress and improves average daily gains. Clean stalls, remove debris and provide fresh water daily. The daily attention to detail is the difference between a Grand Champion and lower placement. 4. PREVENTIVE HEALTH: Establish an effective health program with your local veterinarian. A sick animal never makes it to the top. These are the building blocks of the Honor® Show Chow® program and the keys to successful production. Practical application of these basic principles will not only enhance your animal’s growth and development, but also increase its potential of winning on the show circuit. When mixing rations, PUT ALL GRAINS, ADDITIONAL ROUGHAGES, OILS & MOLASSES INTO MIXER FIRST AND MIX THOURGHLY PRIOR TO ADDING GRAND 4-T-FYER™ OR OTHER PELLETS. This reduces the amount of pellet breakdown and “fines,” which is the main cause of customer complaints & intake problems associated with the use of this product. Keep corn level at or below 60% - this will help reduce hair burn & fluctuations in intakes. Adding additional roughages (ie. cottonseed hulls, beet pulp, wheat bran, etc.) to grower/breeder diets allows for control of fat depositing and will help in giving the appearance of more rib depth & volume. Adjust molasses levels to accommodate mixer/feeder capabilities. The use of Rumensin®, Bovatec®or CTC are recommended, but optional. Always follow label directions when using medications. Feeding a minimum of 1-2 flakes of grass mix hay is beneficial to support digestion & maintain rumen function. Always provide plenty of fresh, clean water at all times. Consistency is essential! Feed at regular times each day. Monitor intakes & watch for irregularities. If a ration change is needed, make sure to do it gradually over a period of 10-14 days OPTIONAL: If you want to add fat quickly, we recommend supplementing your ration with High Octane® Power Fuel™. Include at variable levels depending upon the desired daily intake. Feed at a 20% inclusion rate/per head/per day plus grain and forage. Caution: Store in a dry area away from insects. Do not feed moldy or insect-infested feed.